What to take: When booking for an infant or child, Easyjet allow you to put two child items (buggy, car seat, travel cot etc) into the hold for free (full info on Easyjet's page). I have flown a couple of times now with a baby and was trying to weigh up which carry on bag it would be best to take (spoiler alert, I make the wrong choice in 90% of the decisions I make and this was no different.) I knew I was taking our double buggy with me (so my niece could also hitch a ride when we arrived at the villa) and that I'd have my Tula baby carrier with me and was considering whether my soft weekend bag or pull along suitcase would be best. IF YOU READ NO FURTHER JUST TAKE IT FROM ME THAT YOU SHOULD CHOOSE THE PULL ALONG. ALWAYS THE PULL ALONG. 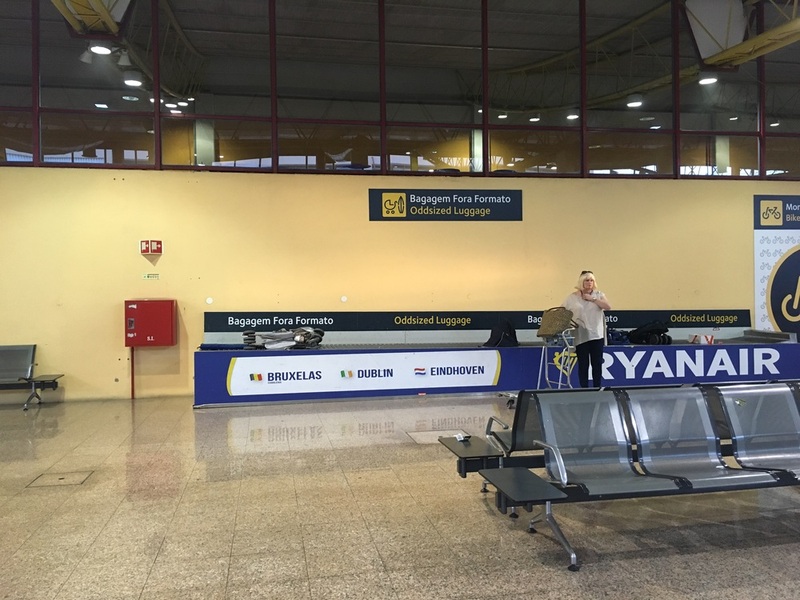 My thoughts were that if I checked the buggy in at the check-in desk, and put the baby in the sling then the pull-along suitcase would be easier to drag behind me, but if I kept the buggy with me until the airside, I could sit my weekend bag in it. The weekend bag fits more in, is easier to squeeze into an overhead locker and carry up and down stairs, and importantly it is an Orla Kiely print, and when I'm in airports its a bit of an opportunity to pretend i'm someone i'm not. Groomed, in control and with an Orla carry on. So there it was, decision made. It was the wrong decision. Our journey to the airport was great. Mr Sprog was working so we dropped the toddler off at Granny's and got the metro to Newcastle Airport. It was all step-free, and as you can see from the photo, my carry on fitted perfectly in the spare seat, so it was a breeze getting inside the airport. The above photos show the tools for this particular job. My Mountain Buggy Duet and the clip of me when I have my Tula carrier half on. This is how I actually walk around in public, and I had the audacity to suggest before that I might pull off looking groomed! Whilst it mightn't be flattering, it's handy to have the Tula on like this, as it means you don't need to fiddle around and put the baby down when you want to put them in the sling. Newcastle Check - In: This is where things started to go a little bit wrong. Whilst I'd had plenty of time when we arrived I'd needed to change and feed the baby. By the time we joined the queue for check-in, staff were calling forward any Faro travellers to jump the queue. So I felt popular, squeezing my tank-like double buggy passed the people in front of me. Anyway, I confidently tell check-in staff I'm going to keep the buggy with me until the airside...only to be told that there are no lifts from the gate to the airside. I'm informed that whilst staff might be around to help me carry the buggy down from the gate to the ground they can't guarantee it. Realising if I wasn't given help, I wouldn't be able to carry the buggy down the stairs whilst the baby was in the sling, I change my mind. The buggy is going to be checked in. I'm then ushered off to oversized luggage, opposite Cafe Ritazza in the middle of the departures. "Excuse me, can I get through? Yes I'm the type of person who checks in just before it closes, with a baby in tow, and gets called forward to push in front of more prepared folk. Soz guys." Where you ditch any larger items that you might be checking in, like car-seats, travel cots etc. Any baby paraphernalia really as it is all massive. At oversized luggage, now already with slightly raised blood pressure as I knew I was starting to be pushed for time, and knowing how heavy that bloody weekend bag was, I quickly had to put on the sling, stick the baby in there, collapse the double buggy and shift it, all the while hoping I didn't end up dislocating the baby's hip or anything as I moved the massive thing. I don't like to rely on other people to help with things like that. I feel like if i'm going to go somewhere by myself I should be able to manage everything that i've taken, but manoeuvring it onto the belt was a real struggle on my own. The staff member at oversized luggage couldn't come out to help me, and there was no other staff around so I had to get on with it. After that I got through security, and duty-free as fast as I could. I'd downloaded the Easyjet app which meant my phone could act as my boarding card which was handy as it meant there was less chance of me losing it than a paper version. The baby was able to stay in the sling whilst I went through security which I was grateful for so I had my hands free for my bags. The carry on bag was so heavy, and the whole way around I wished I'd taken the pull along, but it did mean I could get up and down the stairs pretty easily. When I got to the departure gate, I actually ran into a friend of a friend who demanded that her husband carried my bag along with his own onto the airplane. I must say I was pretty grateful for it as I had a severe case of the airport sweats by that point. Newcastle Airport Baby Change: There are 4 baby change units in the airport. Two before security and two after. We went to one of the ones before security and it was a pretty good facility. It is towards the centre of the check-in desks, near the British Airways desks. You needed to use the telephone near by to get the code number to access it. It was really big, with a pull down table almost the size of a double bed, so it is suitable for people with mobility needs too. Actual legitimate top tip here (plagiarised from Mumsnet of course) but if you are travelling, it is worthwhile preparing nappy sets for when you need to change the baby. You put a nappy and a few wet wipes into a nappy bag, so that you can just pick up the nappy bag when you need to change, without taking loads into the toilet or having to rifle around in your bag to make sure you have everything. Nappy sets prepared for travelling. Flying: The actual in the air bit was absolutely fine. We had an aisle seat on the way to Faro which was probably the best option, as when I was feeding the baby it meant I could use a bit of room from the aisle. On the way back I was in the middle seat, so space was tighter, but we still managed. The baby was asleep in the sling when we got on the plane, but frustratingly I had to take her out of it so put the baby seat belt on. The baby seatbelt connects onto your lap one and goes around their waist. She woke up when I took her out of the sling, but I was easily able to feed her whilst she had her seatbelt on. As it was a short flight I didn't bother with any food for her, and didn't need milk as she was breastfeeding. But the rules are that you can take enough baby food or milk on the plane as you'll need for the journey. Link to formal info is here. Thankfully at 7 months the baby is still pretty happy just sitting on my knee, so was no bother. The only issue was where I could put my drink when I got one as the table wouldn't fit down with her on my lap. The very kind couple next to me offered me use of their table though. We did need to use the easy jet changing table, which was in one of the toilets on the flight. I didn't take any photos, but its actually not as tight a squeeze as you would expect. The table pulls down over the toilet, and I'd taken my pre-prepared nappy set in with me, so didn't have to juggle a baby and a bag. Landing in Faro Airport: I think quite a few airports are like this, where oversized luggage don't go on the luggage carousel like the rest of the flight's luggage, but instead go to a separate bit. In Faro airport, this is along the back wall, opposite the carousels. Juggling the baby and a drink. Travelling from the Airport: To reduce the amount of stuff I had with me, I didn't take my car seat, but instead booked a private transfer too and from Faro airport. The cost for the private transfer was the same as a taxi, but I was able to pre-book one which came with a car seat. I used this company Faro Airport Transfer and they had a couple of sized car seats to choose from. In our private taxi transfer, which came with a car seat. Faro Airport Check-In: So I must say that Faro airport gets much more brownie points from me for travelling alone. Firstly at check-in they confirmed my gate was upstairs and like Newcastle there were no lifts to airside (quite a few gates at Faro don't involve stairs so worth checking.) But seeing that by losing the buggy it meant I'd have to carry my bag they then offered to put my carry on into the hold for free. I was so grateful and quickly pulled out a couple of nappy sets to shove into my handbag. I then moved to oversized luggage (next to the Easyjet desks) to give in the buggy and a member of staff saw me with the baby in the sling and came over to collapse it for me and put it on the trolley. By this point, I only had a small cross shoulder strapped bag, and the baby in the sling so everything else at Faro was easy. Faro Airport Baby Change and Kids Entertainment: The baby change at Faro was small, you'd probably need to leave bigger buggies outside, but annoyingly it was one of those where there isn't a toilet in there too. So if you need to go to the loo and take the baby with you, you would have to use the disabled toilet. I didn't get a chance to take a picture, but Faro airport had a really decent kids play area. It's after security, just before passport control. I saw a slides, tunnel, some computers and highchairs, there are is a pic of it here. Boarding the flight: Easyjet let parents travelling with kids under 5 board the flight first, which is all well and good, but on this occasion they sent us out, but the plane wasn't ready leaving us to wait in the hot sun. Thankfully I hadn't wanted to squash the baby's hat, so hadn't put it in my stowed away luggage, so could put that on her to protect her from the sun. Landing at Newcastle: The oversized luggage at Newcastle just gets put on the carousel, so all of your luggage appears at the same place. Waiting to be able to board the plane - grateful for the hat and sunglasses. If you have a sling then take it with you. Great for getting through security, having both hands free for the steps to the plane and they can be really handy getting an over-tired baby to sleep. Set aside everything you need for one nappy change, and store it in a nappy bag so it's easy to access when you need it. Take a few of these nappy kits with you. Whilst most airlines allow you to check large baby items (buggy, car seat, travel cot) into the hold, check if a car seat can be provided through a transfer or car hire company to save you taking one. If you are travelling somewhere hot, then keep to hand a hat/sun cream for the baby in case you are outside for a while. Lastly just do it. Travelling with a baby really isn't too bad. Doing anything with a baby is already awkward enough that you are used to it by the time you travel anywhere. I would definitely do it again, albeit with a pull along suitcase next time. To be kept up to date with all things baby and toddler in the North East click on these links to follow me on Facebook, Instagram or Twitter for photos, blog posts and general ramblings.